Q. Does the library have any materials about Blaschka and glass eyes? I am most interested in ephemera (cards, posters, etc.). Images: CMoG 93.3.73. 107 Glass Eyes with Box. CMoG 93.3.73-24. Glass Eye, Leopold Blaschka, possibly Bohemia, probably Germany, possibly 1859-1887. Hello! Thank you for your question! We do have materials about the Blaschkas and their production of glass eyes. We have a short video available on the CMoG YouTube channel, "Blaschka Eyes," that you might be interested in. Blaschka, Leopold. Leop. Blaschka 1849 aus Böhmischaicha. 1849. Small handwritten notebook, probably the earliest item in the Blaschka archives. Includes notes on Galvannismus, Versilberung (recipes for using gold and silver); drawings, perhaps of glass eyes and, on the same page, presumably a list of colors for glass eyes. Blaschka, Leopold. Notizbüchel für 1869-1870. Small blue notebook containing business records organized by month. This may be an order book or a listing of orders shipped. Includes orders for glass eyes (Augen) for animals (Thieraugen) and probably for people. Includes orders for tubes (Lymphröfner). [Thank you and public recognition to Dr. Ed. Wengler and glass artist Blaschka]. 1872. Newspaper clipping from an unknown German newspaper. Testimonial about the glass eyes made by Blaschka and used by Dr. Wengler of Dresden for the daughter of Mr. and Mrs. Beyer. Artificial Eyes: Enameled Eyes in Assorted Natural Colors: Price List. New York: Demuth Brothers, [1880?]. Trade catalog. [Billhead dated March 1894 for ingredients for glass eyes]. Billhead, or invoice, listing numerous ingredients including sand, lead, pearl ash, salts, soda, arsenic, etc. on Profs. J. T. & A. H. Davis letterhead. The Davises developed a new type of artificial eye. In 1850, J. T. Davis arrived to America from London, after learning the glass business at his father's shop. "Eyes not exchanged after six week" printed along upper edge. Boissonneau, M. "Moveable Artificial Eyes, Carefully Modelled in Enamel." ca. 1851. Herbert Bayer glasaugen, 1929. Köln: Gebr. König Postkartenverlag, 1993. Postcard. Illustration of glass eyes. Hughes, Michael O. Eye Making: A Brief History of Artificial Eyes Made in Virginia, Washington, D.C. and Surrounding Areas. Vienna, Virginia: M.O. Hughes, 2000. J. Kannofsky, the oldest and largest manufacturer of glass eyes in the world, manufacturer of artificial eyes a specialty, artificial skulls and heads for taxidermists and furriers and full line of supplies for all kinds of fur trade. New York, 1938. Catalog. Glass eyes for taxidermy. Includes prices. Practical Glass-Blowers, Manufacturers of Enamel Colored Artificial Eyes. Jersey City, NJ. : F. Schumacher & Sons, 1920. Catalog. Includes glass eyes. Preis-Liste über Emaille-Augen mit schwarzer Pupille = Prix courant d’yeux emaillés à pupille noire. Dresden: L. W. Schaufuss, 1866. Catalog in French and German that includes glass eyes. Price list of artificial glass eyes for taxidermists and manufacturers, January 1, 1904. Hyde Park, MA: Frank Blake Webster Company, 1904. 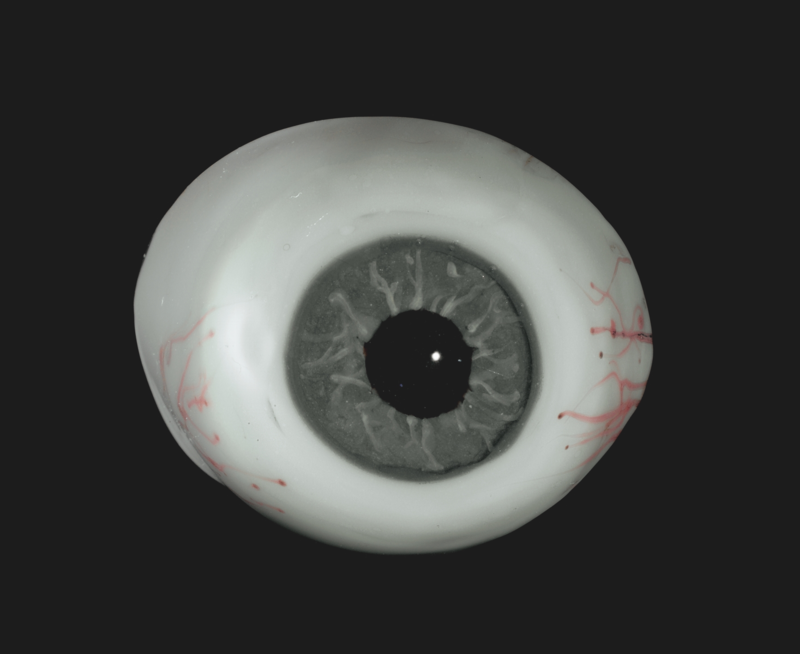 Catalog of glass eyes for taxidermy and humans. “Steps in making glass eyes.” [1935-1943?]. Photograph is of case displaying various steps during process of making glass eyes; twelve glass eyes are used to demonstrate the steps and glass rods are displayed as well. "Compliments of E. & S. Danz, New York, N.Y." -- on plaque on lower right corner of case. "Glass Eye Smuggling? Yes, It Was a Thing!" Blog post. The Corning Museum of Glass. June 16, 2017. "Glass Eyes for Fish?" Blog post. The Corning Museum of Glass. March 14, 2018. Where can I find technical and historical information on reproducing glass eyes? I am looking for technical information about the process the Blaschkas used to make their glass models. 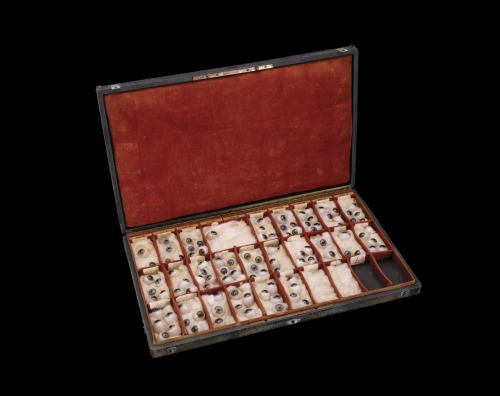 Could you send me more information on the Blaschka works in your collection?